I can credit the start of my career in online strategy in large part to my fascination with online political communication. In 1994, I read about the first online gubernatorial debate held by E-Democracy (of which I am now a board member); but the following year, I was steeped in online political debate and was publishing a Web site devoted to Minnesota politics. In 1998, Blois Olson and I launched MNPolitics.com, which subsequently merged with Politics In Minnesota. As colleagues at Tunheim Partners, then, it was natural that my employer sponsored the most recent Social Media Breakfast last Friday, with a theme of social media and politics, Minnesota politics specifically. The panel consisted of Michael Brodkorb, Deputy Chair of the Republican Party of Minnesota and founder of Minnesota Democrats Exposed; Denise Cardinal, Executive Director of Alliance For A Better Minnesota; Tom Scheck, political reporter for Minnesota Public Radio and blogger at Polinaut; and Rachel-Stassen Berger, political reporter for the Star Tribune, and blogger at Hot Dish Politics. Blois, the Executive Vice President at Tunheim, and a political columnist at MinnPost, moderated. The breakfast was held at the Kelly Inn in Saint Paul, near the capital complex, because it has long been a hangout for lobbyists and politicos. I don’t know what the official headcount was but the place was definitely packed and there seemed to be a great deal of interest in the topic. 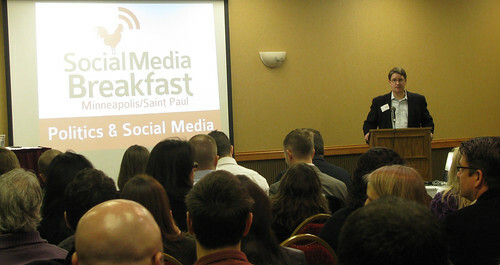 According to WTHashtag, there were 1,621 tweets using the #smbmsp hashtag from 2/10/10 to 2/16/10 from 347 tweeters. The transcript of the Twitter conversation shows pretty engaged interest in the breakfast. In addition to the remarkable work Rick Mahn and Mykl Roventine do putting on SMBMSP every month, I need to give a shout out to our own Team Tunheim for their role in helping pull this one off. Kristin Gast, Natalie Wires & Madeline Koch played an instrumental role in making this event happen from our end. Kay Roseland has published her own photos at Shareology and rumor has it that WCCO TV’s Erica Mayer is going to publish the photos she snapped and Mykl Roventine will likely upload his photos to his Social Media Breakfast set.